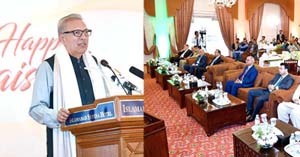 ISLAMABAD, April 15 (APP):President Dr Arif Alvi Monday said Pakistan wanted cordial ties with all the countries and faiths and always desired peace in the region. Addressing a ceremony held here to celebrate Baisakhi, a religious and cultural festival in Sikhism, organized by the Pakistan Television (PTV), he said having sacrificed a lot during the war against terrorism, Pakistan had learnt the value of peace. The event was attended by a huge number of people from Sikh pilgrims coming from across Pakistan, India and other countries, besides diplomats and senior officers from the Evacuee Trust Property Board. He said in his maiden address, Prime Minister Imran Khan had talked for peace with India. He said it took long to heal up the damages caused by the wars always incited by the miscalculations. He said in his address at the Constituent Assembly on August 11, 1947, Quaid-e-Azam Muhammad Ali Jinnah had said that in Pakistan everyone would be free to go to the worship place of his faith. President Pakistan Sikh Gurdwara Parbandhak Committee Sardar Tara Sing said by building Kartarpur Corridor, Pakistan had fulfilled the longstanding desire of the Sikh community. He requested the government of Pakistan to also link Kartarpur Corridor to Nankana Sahib as another goodwill measure for the community. He said the committee had been actively working to uplift the Gurdwaras in Pakistan and hoped that the construction of Kartarpur Corridor would be completed by November this year. Sardar Ravinder Singh Khalsa, the group leader of the Sikh pilgrims from India, in his address, said it was pleasing that Gurdwaras had been uplifted in Pakistan owing to the government’s efforts. He also lauded the government’s measures to provide security, food and other administrative measures for the Sikh pilgrims. He said both Sikhism and Islam had centuries old bonds and hoped that this relation would continue in the future. At the event, two documentaries on Baisakhi festival and Kartarpur Corridor were also screened. PTV Word Head Mirza Masood said PTV was committed to bring change and intended to do more for all the communities living in Pakistan.